Columbus, Ohio – The Harrison West Jazz Stage returns for its fifth season starting Sunday, September 10th at the Harrison Park Gazebo, welcoming the finest in local jazz talent each week. This year’s musical lineup is as diverse as ever, representing a wide range of jazz styles. The series kicks off with Safety Squad, a large ensemble that embraces the music and spirit of Snarky Puppy, with blends of funk, neo-soul, modern jazz, Dixieland and everything in between. The Tim Cummiskey 4tet is a jazz-fusion group that performs creative arrangements of jazz standards and the music of driving force fusion artists such as Allan Holdsworth and Pat Metheny. The Robert Mason Trio represents the next generation of the highest musical talent in Columbus. You can hear elements of jazz, blues, gospel, and current R&B favorites. To end the season, Brasileira, started by Kelly Crum Delaveris and Vaughn Wiester, will perform songs from the Tropicalia / Musica Popular Brasileira (MPB) era. The Harrison West Jazz Stage will take place each Sunday in September from 1:00 – 2:30 p.m., starting on September 10th and ending on Sunday, October 1st. Concerts will be held at the Harrison Park Gazebo located at West First Avenue and Harrison Park Place. The event is child-friendly with an accompanying playground within the park. Musicologie, a Grandview Heights based music-lesson studio, will provide exciting musical activities for children from 12-12:45pm. All performances are FREE to the public. Food may be purchased from participating food trucks. A rain date of October 8th has been established in the event of inclement weather on any of the scheduled dates. 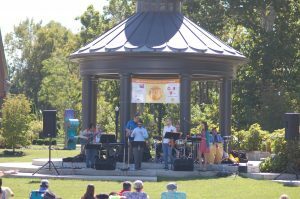 Each week hundreds of residents from all over the city gather to relax on a Sunday afternoon and take in the sounds of jazz set against the riverside park and gazebo. Cheers to the sponsors who are helping to make it all possible this year: Harrison West Society, Wagenbrenner Development, Katalina’s, Cover My Meds, Thompson Hine, Abitec and Integrated Building Systems. Founded in 2013 and performing at the Harrison Park Gazebo, the Harrison West Jazz Stage seeks to celebrate the work of local jazz musicians across a variety of genres, foster community among neighbors and raise the profile of the Harrison West neighborhood. For more information, visit www.Facebook.com/HarrisonWestJazzStage.